The Pillars Of Contentment – Building A Foundation For A Happy Life provides you with practical and easy to follow information on how to start leading a more happy life. The article is based on government studies, psychology, science, philosophy, and experience. Continuously updated as research becomes available. Join the newsletter for updates and top quality articles. This how to be happy guide is not meant to cure depression. If you are seriously depressed please ask for help. You are worth it! You deserve to be happy! The basic foundation to build a content and happy life. You don’t have to hit all of the sub areas, they are simply suggestions on ways to meet each criteria. Many activities include multiple, or even all of the pillars. Listed below on each top are resources that could help you. Each section is certainly not complete. My goal is to provide information to help you understand and build each pillar. 1) Meaningful job, educational path, serious personal interest, or a combination. Having a job gives you a purpose, helps you keep your sleep patterns in check, and helps you maintain the minimum or more economic resources. Everything you need to know about whether money makes you happy. Buying objects provides brief happiness. Experiences however can actually grow in value. Also, having experiences can work towards other Pillars Of Contentment such as socializing. Create a meaningful plan for yourself of how you’d like your life to be. What would you want your story look like in three years? In addition to long term plans, create short term plans. This can include weekend plans and day to day plans. Try to plan in something fun so that you can look forward to it. You don’t necessarily need to follow through, but simply having the plan and having something to look forward to can make a world of difference. Instead of focusing on daily goals, focus on a system that automatically helps take care of those goals. For example creating a schedule. Having a system can greatly help with your self discipline. There is an incredible amount of research that reinforces the positive impact of exercise such as stress relief, self esteem boosting, improved blood pressure, lower risk of heart disease and stroke, cognitive improvement, weight loss, etc. There are so many benefits and the great news is that it doesn’t have to be spending hours at the gym. Even simply going for a 30 minute daily walk has massive benefits over not working out at all. Sports are a great way to workout because you get exercise while having fun, and socializing. How do you talk to yourself? How do you treat yourself? Do your best, weed out the bad stuff, be supportive of yourself, listen to yourself over others. Be humble. Kill the ego. Try to find at least five friends, including at least one or two people that you can really talk. Be Proactive, not reactive. Move beyond small talk. Work towards a close, intimate, romantic relationship. This subject alone has countless books and websites so it will not be expanded on much here. Meetup.com and dating sites are great ways to meet people. From The Four Agreements: A Practical Guide to Personal Freedom (A Toltec Wisdom Book) – Reading this book is highly recommended. We increasingly spend our lives in artificial environments— walled inside and divorced from nature. Within these nature-free settings, noise is often annoying, and lighting is often artificial, of low intensity (often less than 10% of the light intensity on sunny days), and composed of nonnatural spectra and rhythms. As the burgeoning field of environmental psychology demonstrates, the psychological costs of such settings can be wide-ranging. These costs include disruptions of mood, sleep, and diurnal rhythms. Cognitive costs include short-term impairment of attention and cognition as well as long-term reduced academic performance in the young and greater cognitive decline in the elderly. Further psychological difficulties occur in special populations such as those with Alzheimer’s disease and postsurgical patients. Eating properly and taking care of your health can make a world of difference. Eating properly can significantly boost your energy and quality of life. Also it helps to improve your health and help you live longer. Making sure you take care of your health in general is a major factor to being happy. Get enough sleep and try to wake up at the same time every day. If you get tired during the day a 20 minute power nap can work wonders. Do not nap more than 30 minutes. Make sure you stay hydrated. Drink half your body weight in ounces of water daily. Lots to expand on this area. Helping people can make you feel happy. You could volunteer or simply help an old lady cross the road or hold a door. A little bit can go a long way and you can completely change someone’s day and their life by showing a small amount of care. And the best part is it makes you happy as well. Having time dedicated to having fun is a very important way to de-stress and bring extra happiness to your life. It is very important to schedule time for fun to balance out the rigors of the work life. Recreation can be a great chance to get more socializing in as well. The Fixed-Mindset aim is to achieve validation. The person constantly tries to prove himself, and is highly sensitive to being wrong or making a mistake. Failure brings doubt, demeans character, and destroys confidence. As a result, a person with a fixed-mindset, always feels anxious and is vulnerable to setbacks or criticisms. The Growth-Mindset is about achieving mastery and competence. The person believes that superb personal qualities can be learned, developed or cultivated. Failure is only feedback about performance, not a judgement of personality, potential or value. A person with growth-mindset is eager to learn to boost performance and enjoys exploring, experimenting and stretching limits. Criticism and setbacks have little negative impact. I am not a medical professional and none of what I have written should be regarded as professional medical advice. This guide is not meant to instantly bring you happiness and be an all inclusive solution. The intent is to help you build a foundation for a successful and happy future and to provide you the resources to further explore the subject. I highly recommend exploring the subject matter using the links to the professional resources provided. 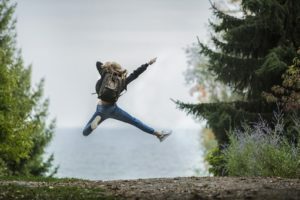 The Pillars Of Contentment – Building A Foundation For A Happy Life article is based on the research of Psychologists Dr. Jordan Peterson, Dr. Roger Walsh, Brené Brown,Dr. Russ Harris with slight hints of the PERMA model.